In honor of today’s kickoff, I’ll share up one of my favorite reggae albums. Released on Greensleeves, a classic dub full length from Scientist. In support of the highly anticipated Tectonic compilation featuring remixes from dub reggae pioneer Scientist, the two appeared on BBC Radio 1’s Gilles Peterson show a few weeks ago. In support not only the album’s release and the live shows celebrating the release, the two sat in for a short set. This might be your best chance to experience these tunes before the albums impending release next week on 6-Dec, some deep reggae cuts from the legendary Scientist are mixed in as well. Definitely worth picking this one up for a the listen. Full tracklist beneath the fold. I know I am not the only one who was drawn to dubstep by spending formative years of my youth listening to reggae albums, especially dub. 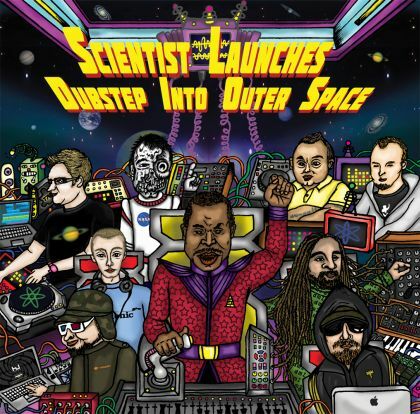 Honestly, Scientist has always been a personal favorite; no disrespect to King Tubby for being the originator and no disrespect to Mad Professor for embracing new technologies in an old sound however Scientist seemed to always sit perfectly in the middle of the proto, and the present. Fact Magazine revealed the tracklisting for Tectonic‘s upcoming collaborative project with dub reggae pioneer Scientist. As I stated on Twitter earlier today, without having discovered the sounds of King Tubby and Scientist I likely would not be listening to or djing dubstep at all. The influence of dub reggae’s aesthetics is prevalent among any honest dubstep releases. It is clear to understand why Pinch regards this release as a seminal moment in the history of Tectonic; it is clearly an important moment for modern bass music in general. Can’t wait to have a copy of Ill Kontent and City Cycle available for personal listening and playing out finally, and obviously can’t wait to hear how Scientist has reworked these tunes.